Since more than 50 years, Uebler is a German manufactury of preium-solution for bicycle / e-bike transport with cars, Motorhomes or caravans. Extremly leightweight - but also safe constructions, easy tpo handle and a maximum quality (Made in Germany) are the basis of these famous bikeracks. The ergonomie of these racks is unique und award decorated since long years. 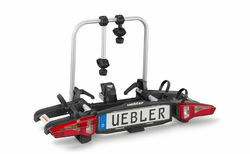 Uebler privides a range of racks, which matches nearly every customer wish perfectly. Leightweight, foldable and with legal road approval these scooters stands for a useful, daily ride on public streets.